If you are a Jurassic Park fan like me, your mind might have moved towards the possibilities of it ever existing. I have lived in Costa Rica for a couple of months now and I won’t deny that I relate this country to my Jurassic fantasies just a tiny bit. If you read on, I can take you to places in Costa Rica where you will feel like you have been sucked right into the movies. Places where you can hike, dive, drive or just relax while being surrounded by landscapes offering a primal and otherworldly charm. But first, let’s explore this whole area of the “possibilities”. The idea of real-life dinosaurs really seems to speak to people’s imagination. The other day I read an article focusing on just that. In 2015, LiveScience published an interview with a scientist who is researching the actual creation of smaller dinosaurs. Such ‘vanity projects’ are a far cry from what we should be focusing on with the resources we have, but the idea really seems to have taken hold regardless. We love the idea of bringing our fantasies to life. But should we do so just because we can? One might argue that they have made 5 films about why this is not a good idea. But as times have progressed, so have the movies. The initial voice of the films was rather dark and often guided by fear and doubt, though not void of love, beauty and respect. The last ones have simply replaced fear with entertainment in the completion of “the extinct creatures zoo”. The concept of ‘what is life’ and ‘what kind of life is valuable’, has often found its way into bigger debates. Jurassic Park: Fallen Kingdom jumps right in the middle of this discussion. With the looming threat of (re)extinction, the question arises if cloned creatures are worthy of protection. The film plays with the tension between the cloned girl and the cloned animals. For years we have identified with Jurassic Park’s inhabitants as striking copies of what was once real. Although many references were made to them being real predators with real instincts, and some real gentle giants with real pain, we still couldn’t quite divorce ourselves from the level of pure fantasy. But the girl, we instantly took as one of us. We felt what she felt and understood her desires. To then discover she is a clone, what does that mean for the dinosaurs? Aren’t they the same as well? And if we choose to create them as a pet or for an attraction in a zoo, aren’t we completely ignoring the message the franchise has left us with? Here is a better idea! Those who wish to get a sense for the real-life Jurassic Park, can simply do so by traveling through Costa Rica. You can marvel at the unique atmosphere dominating these destinations where the sense of Jurassic inhabitants can easily be imagined. To be honest, you can go almost anywhere in Costa Rica and experience this sensation. But here are some places that possess that extra bit of magic. Does this island look familiar? 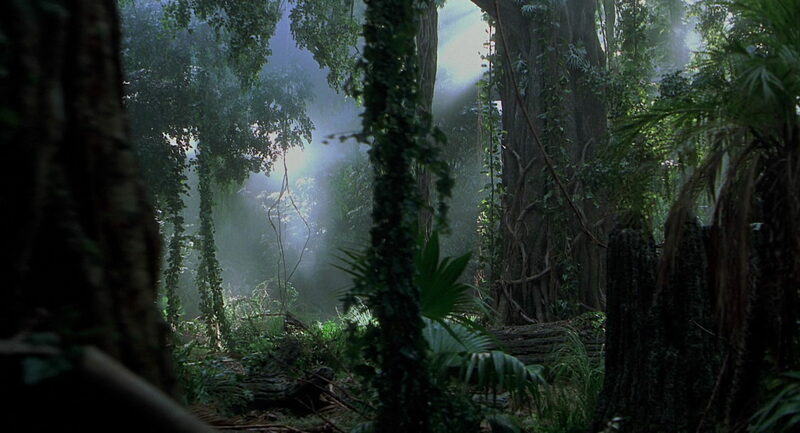 That is because it has been used as the opening shot representing Isla Nublar. As a registered UNESCO World Heritage Site, the actual island is pretty restricted for tourists and the greatest level of respect is requested. Isla del Coco has been called the Galapagos Islands of Costa Rica. The dense, feral jungles house caverns, waterfalls and rare animals species. You can take a boating tour to Isla de Coco but note that these are pretty expensive. Above all else, Isla del Coco is a haven for the serious scuba diver. The Jurassic Park movies are also known for some stunning waterfalls setting the scene. The giant beauty introducing the island in the first movie is not in Cost Rica. However, we can offer an amazing alternative. You can reach the Diamante Falls on a wonderful hike ending in a well-deserved dip in the cool waters. We have some more waterfalls on the list but this one is more remote and has a bonus feature. The caves behind the waterfall now serve as lodgings and you can actually spend the night in your own luxury cave veiled by this magical cascade. Isn’t that something? You don’t have to take a tour to get some real Jurassic vibes. You can simply grab a car and take route 126. This road cuts through some incredible jungle scenery. Along the way you can make a stop at the La Paz waterfall which practically spills right onto the road. If you want to get out of the car and hike, you can pay a visit to Poas Volcano National Park. Hiking through the area of Bajos del Toro will be an enriching experience. The unique biodiversity along with the thundering Toro waterfall make for an exciting day in the jungle. One thing you definitely want when trying to conjure up the image of Jurassic Park, is a destination without a lot of tourists. Meet Barva, the often overlooked volcano wedged in-between its famous brothers, Poas and Irazu. This challenging hike can take you to 4 lagoons. Although stunning in all conditions , the most mystical moments reveal themselves when the mists roll over the water. If you are up for a real challenge, climb the highest peak in Costa Rica! Cerro Chirripo stands proudly at 3820 meters. This climb is pretty strenuous so it is advisable to spend the night in one of the mountain huts. One of the thrills climbing this giant, other than the physical challenge, is the natural diversity you will encounter along the way. The pastures at 1000 meters slowly transform reaching its climax in the Tundra ecosystem near the summit. Expect to see evergreen lower montane forests as well as montane rainforests where you will find oak trees reaching up to 50 meters flanked by bamboo and ferns. Osa Peninsula is one of Costa Rica’s most remote locations, but also one of the most majestic. In a way, Osa is Costa Rica’s wild child. The jungles have a rugged charm and remain a little rough around the edges. The giant expanse of mangroves and vast rain forests house the largest population of Jaguar and Tapir. Osa is slightly less visited by tourists because of its location but deserves a spot on the list of any true nature lover. It is the perfect destination for the adventure tourist but also suits those wanting to relax and bask in a real-life Jurassic Park atmosphere. Home » Costa Rica Travel » My Costa Rica Travel Blog » Real Life Jurassic Park?